Has Apple learned its lesson? 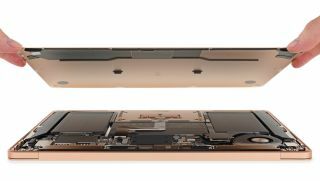 First, iFixit took a look at the keyboard, and as expected it's pretty much the same as the one found in the new MacBook Pro. It has Apple’s Butterfly switches and a silicone membrane that keeps the key presses quiet, and should act as a method to prevent dust and dirt falling between the keys and causing problems.